The problems of transmitting a classical message via a quantum channel (Chap. 4) and estimating a quantum state (Chaps. 3 and 6) have a classical analog. These are not intrinsically quantum-specific problems but quantum extenstions of classical problems. These problems are difficult due to the noncommutativity of quantum mechanics. However, quantum information processing is not merely a noncommuting version of classical information processing. There exist many quantum protocols without any classical analog. 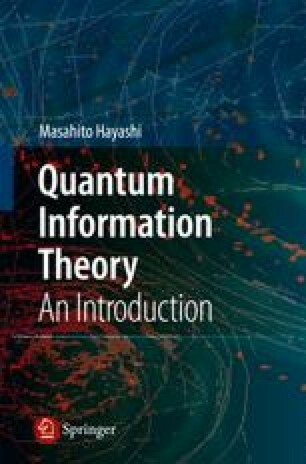 In this context, quantum information theory covers a greater field than a noncommutative analog of classical information theory. The key to these additional effects is the advantage of using entanglement treated in Chap. 8, where we examined only the quantification of entanglement. In this chapter, we will introduce several quantum communication protocols that are possible only by using entanglement and are therefore classically impossible. (Some of protocols introduced in this section have classical analogs.) We also examine problems such as the transmission of quantum states (quantum error correction), communication in the presence of eavesdroppers, and several other types of communication that we could not handle in Chap. 4. As seen in this chapter, the transmission of a quantum state is closely retated to communication with no information leakage to eavesdroppers. The noise in the transmission of a quantum state clearly corresponds to the eavesdropper in a quantum communication.